At the Triceraton Marine barracks on Zogneb, in the Arzak System, Zad is bragging to the other new Marine recruits about the superiority of Triceratons over any and all mammals. 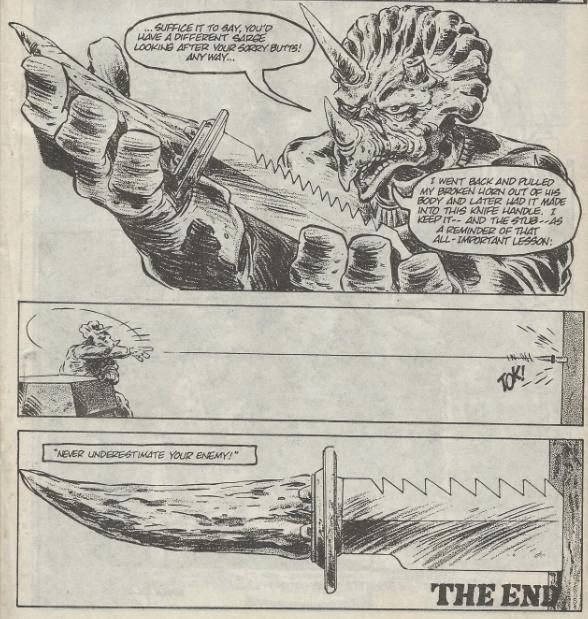 Laughing, the other green Triceratons are inclined to agree with him, at least until Sergeant Zule walks in and plants his massive hunting knife in the middle of a table. Reprimanding Zad and the other Triceratons for their cocky attitudes, he tells them never to underestimate an enemy, even mammals. Picking up his knife, he then decides to tell them the story of how he lost his left horn and why he never got reconstructive surgery for it. Some years ago, Zule was part of a Triceraton Marine force deployed to a planet where the Triceratons and the Ursids (giant bears, essentially) were disputing ownership. Scouting through the woods, Zule spotted an entire Ursid platoon. Racing to report their location to his unit, Zule was met by an Ursid scout. They stared at one another for a while, and then threw down their weapons, as gunfire would alert both sides to their location and ruin any strategic ambush for both parties. The Ursid and Zule both drew their knives and went at it. The pair rumbled for quite a while; the Ursid eventually getting the upper hand, disarming Zule and planting him into the ground. The Ursid then drew his knife and rushed Zule at full speed. Zule only had time to lower his horns and aim them at the approaching Ursid. The Ursid then impaled himself on Zule’s left horn and broke it off in his chest. The battle won, Zule staggered to his feet to reconvene with his unit. He found that while he had been fighting the Ursid, his unit had already met with the Ursid platoon and both sides had completely wiped each other out. Had the Ursid scout not challenged him, he would have died in that battle, as well. Zule eventually returned to the Ursid scout’s corpse, retrieved his broken horn and had it fashioned into the handle of a hunting knife. Story time over, Zule explains that he keeps the knife and the stub as a grim reminder never to underestimate one’s enemies. *According to solicitations in TMNT (Vol. 1) #8, this was supposed to be a bimonthly series. Didn't work out, I guess. Now this was a cool little short strip if there ever was one. In the TMNT universe, the Triceratons are always portrayed as this generic “evil alien race” and really, don’t we have enough of those in the world of science fiction? 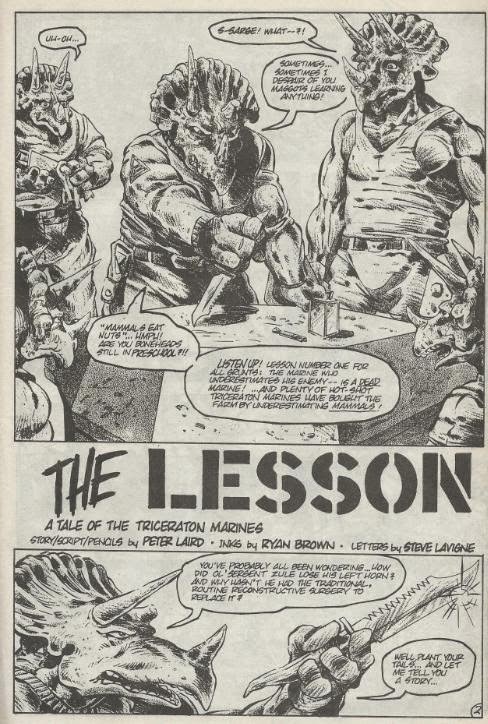 As with the rare TMNT story that chooses to focus on the Foot Clan’s side of the coin, its genuinely refreshing and enlightening to see a story focus on what the Triceratons are like when they aren’t antagonizing the “good guys”. Although still portrayed as ruthless war machines, “The Lesson” shows us that they’re not brainless or emotionless “monsters”, either. Zule illustrates that even the most hardened Triceraton Marine is capable of displays of honor and respect toward one’s enemy. It’s always nice when two-dimensional villains are given an extra smidgen of depth, and in regards to the typically bland Triceratons, every little bit helps. Visually, I think this is one of Laird’s masterpieces. No one can draw a Triceraton better than him, that’s for sure. The action and drama is staged especially well, from the Marine recruits just lounging around the barracks to the battle between Zule and the Ursid scout on the jungle planet. Most of the battle is silent, but the blows are choreographed really nicely, with Ryan Brown’s inking making things look extra brutal and nasty. Personally, I wouldn’t mind seeing Sergeant Zule pop up in a future TMNT comic, given that he’s one of the elite few Triceratons to actually have a shred of character depth. 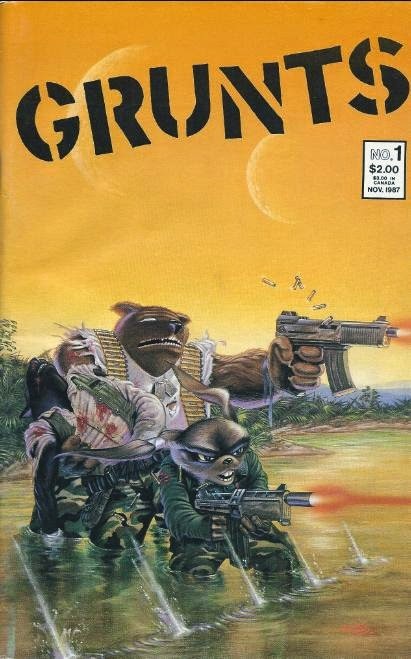 As for the whole of Grunts #1, well, like any anthology title, it’s got its ups and downs. As much as I like “The Lesson”, my absolute favorite story in the collection is “Monuments” by Michael Dooney. A silent story starring Fluffy Brockelton from “Gizmo”, it’s really very moving and the best of all the Gizmo shorts Dooney has produced. 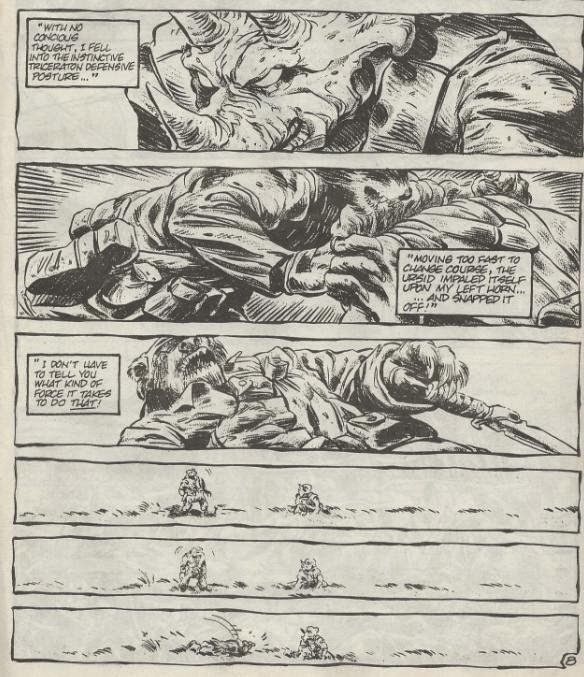 In addition to that, well, Eric Talbot’s “Slaughter Dogs” is just as kickass-looking as anything else Talbot has ever drawn. The rest? Meh. But the three I just listed are worth tracking this book down all on their own.